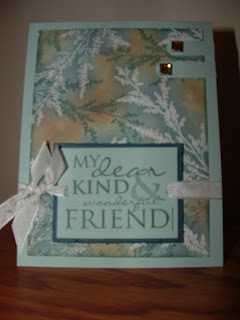 A Stamper's Diary.............. Pressing On.......: "Come on Faye, you know I need feedback....."
made for the last while and I would look at all of her latest creations and we would ooooooohhhhhh and ahhhhhhhh over eachothers creations......didn't realize at the time how key that was to keeping us stamping!! I would carry my creations down to work and show my buddy Ruth, and she would pull out her little plastic case and show me what she was working on.....again - sharing. My pal Pam would look through my stuff and say hey, can I copy this? Or once she gave me a BD card in the shape of a mitten and I copied that several times putting my own twist on it.....sharing........it's a huge part of stamping..... 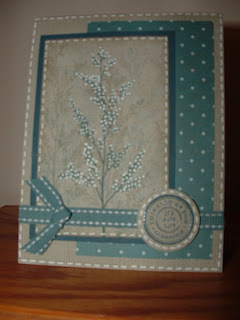 I missed that so much here, but now I can blog, post to my gallery, etc etc and get some friendly stampers feedback......I have discovered that that is it in a nutshell, I NEED FEEDBACK!! So please take the time to leave me some, and leave a comment on my blog....how cool to look and see all the comments......my pal Alison Sosinsky from the good old days when I lived close enough for DL meetings, comments from DL, and just friends, I love it!!! 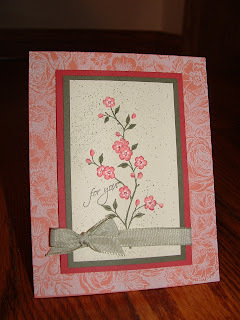 (SO nice to hear from Lois, my stamping sister...and friend,....) So tell me- are you loving this set too? The possibilities are endless and I had to FORCE myself to stop and move on to another set.....Another thing is this,,,,,,I need MUSIC on my blog.....I have my daughter working on that for me......I go on Cindy Lawrence's blog and I feel like wow, (after I get over drooling over her cards) I could just stay there for a while and watch the slide show and the music, she has entertainment on HER blog......and now even though I was so proud that I HAVE a blog....well.....I need music...........and slide shows, etc.,,,,,hey Cindy- how do you DOOOOO all that???? :):):) I miss Cindy too.....I miss everyone. the best!! 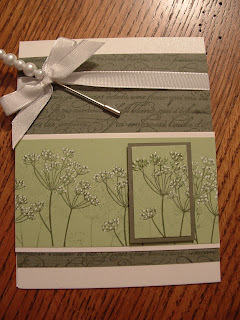 Okay- now here on your left is my most favorite of favorites of all the cards I made with this set........Ain't it purty???? I made this one AFTER I had put the set away and said NO MORE.......it just jumped in to my head and I had to try it.......you really NEEEEEEEEED this set - seriously - this is a small sampling of the cards I made with it - look on my gallery - geez I feel like a hotshot saying that - "Look at my gallery" - I am such a wanna be......haha...but you will see that there are endless possibilities with this set....how about that new taffetta ribbon? Sure made me stop belly-aching about the narrow organdy being discontinued!! There are so many new things to play with and so many more stamps to stamp.......I feel another late night coming on...........Okay - now listen, I was gonna try to go and get that other pretty card that I wiped out....but I just know I'll blow the whole thing up trying and all of this blabbing could be LOST forever.....so if you want to see one of my OTHER favorite cards with this set,,,,you'll just have to stop by "my gallery" - (I feel like such a stamping yuppy....)See you all there! !